“Finale” is not a great piece of television. I enjoyed it immensely in the moment, yet I imagine that when I return to it down the line, it will appear too long, overly mawkish, and self-congratulatory in ways that will make me feel like a lazy critic for having smiled so widely and stupidly through my first viewing. The episode gets sloppy with the details of the documentary—If the crew is just returning to film the reunion, why would they know about Jim’s fake lap-band surgeries?—and massively undercuts one of the basic themes of the series as a whole. Yet in spite of these and other critically lensed misgivings, this is the finale The Office needed. Prior to the episode, I read a few of the critical overviews of the series that kicked around the Internet in the days leading up to “Finale.” It would appear that for all of the grumbling about the diminishing returns of recent seasons, The Office will be fondly remembered for the things it did correctly in the years to come—yet I can’t remember previously coming across the observation that seemed to crop up in most of the long-read send-offs to the show: The Office is, and always was, an inconsistent program. In his look back at the show, HitFix’s Alan Sepinwall noted that the tone of The Office could vary wildly within a single episode—something that’s been true a few times this ninth season, but not a symptom I would’ve diagnosed within the entire series. But whether your diagram of the show’s quality looks like a fairly tame roller coaster (steady incline through season five, preciptious drop, with a pair of smaller humps on either end of season eight’s deep valley) or something a little more unhinged, the scattered-ness of “Finale” makes for a fitting encapsulation of The Office. This is, after all, an episode where Dwight fires Jim and Pam out of friendship and one where a baby is simply handed to Nellie, because fertility was a plot point for her at one time, right? This is a series-ender as unwieldy as The Office itself, and one that doesn’t hesitate in exposing the show’s big ol’ heart. You have to be a big softy to have stuck with the show for this long, and that sentimentality will go a long way toward appreciating the positions in which “Finale” leaves the employees of Dunder Mifflin. Yet the warmer tones of the later years will likely overshadow the fact that not everyone’s “happy ending” is so happy. Sure, Pam and Jim decided to follow Darryl to Austin—the new home of Athlead—and Dwight got the girl and the manager’s seat. But being asked to attend the documentary after-party is the most positive thing to happen to Toby all episode, and Ryan and Kelly are almost certainly at the start of another, horrifying downward spiral. These are appropriate developments for the characters, but, again, signs that “Finale” is not all jobs in Cornell admissions and baskets of kittens. The Kapoor-Howard Recoupling (here’s a free episode title, Big Bang Theory) gets at one of the major themes of the episode, one that helped Greg Daniels’ script avoid some of the major pitfalls of series finales. This is a series that believes deeply in cyclical patterns. It’s something the British Office—which put a roundabout right there in the opening credits—passed on to its American cousin. For years, the characters of the second Office have gone ’round and ’round, stuck in an orbit circling Dunder Mifflin Scranton; it takes a mass of Holly Flax-like importance to break the gravitational pull of the place. 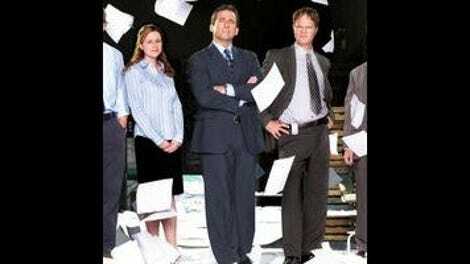 “Finale” honors this concept up and down its extended running time, beginning with the “everything old is new again” vibe that emits from Dwight’s Dunder Mifflin one year after the documentary aired. For one thing, Devon’s back! You don’t remember Devon, because he was fired at a point in the series where the people in the back of the office hadn’t developed personalities—which is probably why Dwight likes him so much—but he’s back! Stanley’s retired, but he’s been replaced by Better Off Ted’s Malcolm Barrett, whom Phyllis wants to turn into Stanley by pumping him full of fudge. But those are the inconsequential cycles: What you really want to hear about (and talk about, assumedly) is the return of Michael Scott, the not-so-secret cameo that, even though its arrival is plainly telegraphed, is still played with a level hand and the appropriate yuks-to-pathos ratio. (Dwight to Michael, each achieving a matrimony-based dream: “I can’t believe you came!” “That’s what she said!”) Here’s the pull of the place that brought all of these people together in full force, bringing the old boss back so he can see what’s become of his surrogate family. Carell doesn’t get a lot to say—he’s already had his chance to say goodbye—but that just makes each of his lines count more. In his lone talking head, Michael demonstrates that his hair color may have changed, but being in Scranton will always have a weird effect on his tongue: “I feel like all of my kids grew up and they married each other. It’s every parent's dream.” He has actual kids of his own now, but he reverts to that former line of thinking when he looks at Jim, Pam, Dwight, and Angela. As the final episode of The Office, "Finale" is at its best when it’s closing loops for characters, rather than presenting them with a finish line. Oddly enough, Andy’s comeback story is one of the most effective, since it winds back the clock and puts him back in the penny loafers of a nerdy Cornell graduate who’s just a little too over-enthusiastic about his true loves: his alma mater and making instrument noises with his mouth. And it’s good that the episode just leaves him there, because if there’s anything these last few years of the show have proved, it’s that the more motions you put Andy Bernard through, the less pleasant he becomes. I’m less sold on Jim and Pam’s plans, though the panel discussion about the documentary gives a lot of fun, winking reasons for why Daniels and his fellow writers would want to do more for the Halperts than close a circle. As a fan of The Office, I’d want Jim and Pam to break the cycle and go find their fairy-tale lives in the Live Music and Apparently Sports Management Capital of the World. As a critic who’s watched and analyzed the ups and downs of the Jim-Pam drama this season, I feel as though I’d like my admission charge back. Dream big and chase those big dreams and all that, but after the “you’ve always been enough” speech from “A.A.R.M.”, it seemed like the show had finally agreed that being in a rut ain’t so bad when you’ve got a great partner by your side to rut around with you. The Office has proven that the traditional metrics of success—wealth, power, fame, ratings—don’t mean jack when you’re dealing in the everyday lives of people like the ones who worked and continue to still work at Dunder Mifflin. You can see it in that moment when Andy exits the auditorium to find chanting throngs of The Office: An American Workplace fans. Often, the signs that we’re doing the right thing, and doing it successfully, take time to announce themselves: As was regularly cited in reflections on the series (including the one NBC itself commissioned), the people responsible for The Office didn’t know they might have a hit on their hands until they looked at the iTunes downloads for the second season. In the case of “Finale,” I think the ultimate success or failure of the episode won’t be determined by how well it holds up years from now (probably not well), or how it stands up as a cohesive piece of TV comedy that brings itself to a halt while suggesting that life carries on for its characters (just barely). To me, the quality of this series finale is found in the way it functions right now, in the afterglow of a TV show to which many devoted more than 100 hours of their lives. Some aspects of the episode fall flat, but when it hits, it hits. Erin’s reunion with her birth parents is a perfectly cast, beautifully acted finale moment. Dwight persuading Jim and Pam to let him fire them so that they can receive some fat severance pays a little more tribute to the triangle that made “A.A.R.M.” such an 11th hour treat. There’s even some transcendent stuff to be found in the concluding talking heads from the main cast members, sprinkled among the self-congratulatory passages. 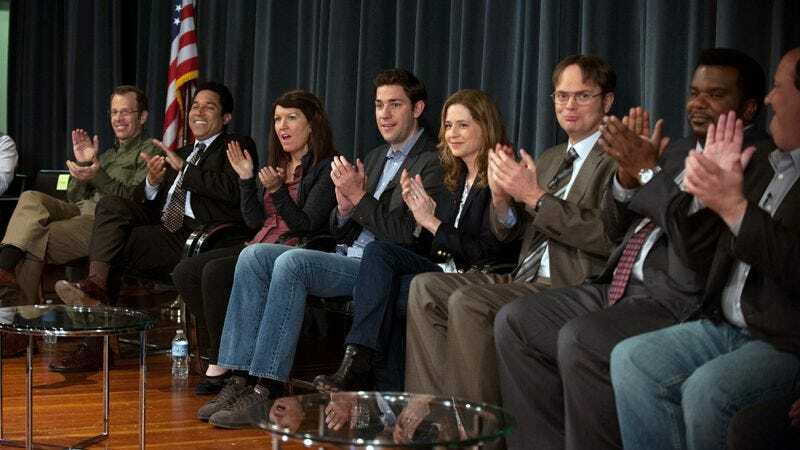 Most importantly, there is the laughter, the voice, the dramatic acumen, the characters, the relationships, and the warmth that made The Office worth watching, even during its darkest days. It gets sentimental, but it deserves to get sentimental. While the best episodes of this series have a tight focus, even a classic like “Initiation” has itself pulled in multiple directions. What kept the whole enterprise grounded were the people at the core of stories like. The office was always there, and all roads from the office lead back to the office. That’s why the last image of the series is the big, gray cinderblock the show called home for nine seasons. It’s not the most eye-catching building, but what truly matters is what went on within. It could verge on sloppy, but it could also be the funniest stuff on television in a given week. And that makes “Finale” just the right point to jump off of The Office’s circular track. I suspect this will be a constant source of conversation below, but which was your favorite callback to a piece of the show’s history planted within “Finale”? I love the twisted traditions of life on Schrute Farms, so recalling that the Schrutes get married while standing in their own graves was a nice touch.